Felicity Finch, one of the world’s most instantly recognisable voices, has been honoured by the University. 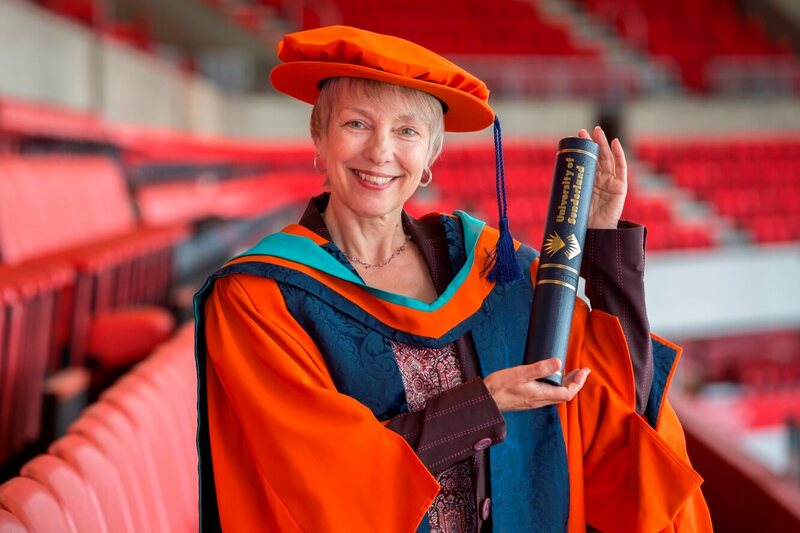 Actress Felicity Finch, who has played Ruth Archer on the popular BBC Radio 4 show for 30 years, received an Honorary Doctorate of Art from the University of Sunderland. She said: “I’m extremely honoured to receive this award, even more so from the University of Sunderland, which I think of as very much home ground. I am very proud to have been brought up in the North East. “I have loved working with students in this University, and it’s wonderful to see how much they have achieved. Felicity Finch was brought up in Redcar and Eaglescliffe. She was already a successful stage actress, having played at the Old Vic in London and Live Theatre Newcastle, when she joined The Archers in 1987, after the director of the Playhouse recommended Felicity to an Archers' producer. Now a key member of The Archers cast, she has also forged a successful career as a presenter and reporter, with her features and documentaries regularly appearing on Radio 4 and the World Service; her work has been nominated for a prestigious Sony Award. Felicity Finch received an Honorary Doctorate of Art in recognition of her outstanding career as an actor, radio presenter and reporter. The Archers is the world’s longest running soap opera. It first aired nationally on 1 January 1950, and is one of the most listened to radio programmes in the world – with over 5 million listeners in the UK, and a further 1 million online listeners worldwide. The University of Sunderland’s Graduation Ceremonies are estimated to bring £1million annually to the region and are attended by over 11,000 students, family, friends and supporters.